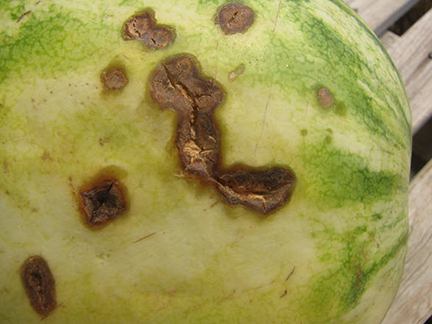 The long, cracked lesions on the watermelon shown above are anthracnose, although they are atypcial of this disease. ​Late in the 2015 season, I observed some unusual symptoms of anthracnose on watermelon fruit. I wanted to discuss these symptoms, but first a little background of cucurbits. An extension bulletin on this subject may be found at https://www.extension.purdue.edu/extmedia/bp/bp-180-w.pdf. Anthracnose of cucurbits, caused by Colletotrichum orbiculare, is responsible for lesions on leaves, stems and fruit. Crops affected include cucumbers and cantaloupe, however, watermelon is the host most often affected in Indiana. Although lesions on leaves and stems can cause significant loss, it is the lesions on fruit that cause direct yield losses. Lesions on watermelon fruit tend to be close to the ground where the fruit tends to stay wet. These lesions are typically round, sunken and orange to salmon colored (Figure 1). However, the lesions I observed toward the end of the 2015 season differed from the typical. Instead of regular round lesions, the symptoms I observed on the bottom of affected watermelon were cracked areas that at first glance appeared to be a wounds (Figure 2). Closer inspection, however, revealed the fungus C. orbiculare and lab isolations yielded the same fungus. In addition, I was able to find foliar symptoms of anthracnose when I went to the affected field. While it is possible that secondary fungi infected and enlarged the anthracnose lesions, C. orbiculare caused the original infections. Inspect fruit for lesions and, if necessary, have the lesions officially diagnosed. Only when the cause of the symptoms are understood will it be possible to manage the problem properly. 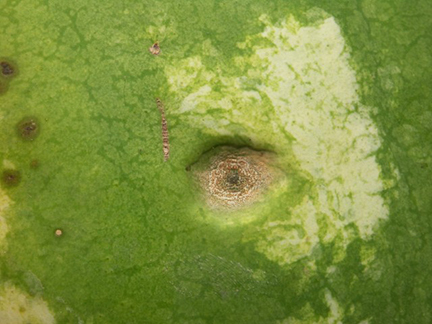 Anthracnose on watermelon fruit, caused by Colletotrichum orbiculare, is typically round and sunken.